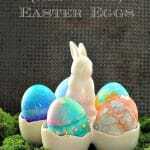 Naturally Dyed Easter Eggs and the BEST Easter Bunny Book ever! 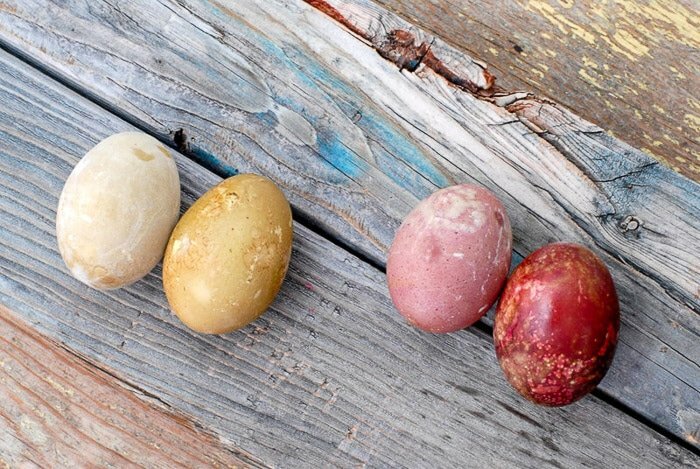 Natural Dye Easter Eggs are easy and fun to make. 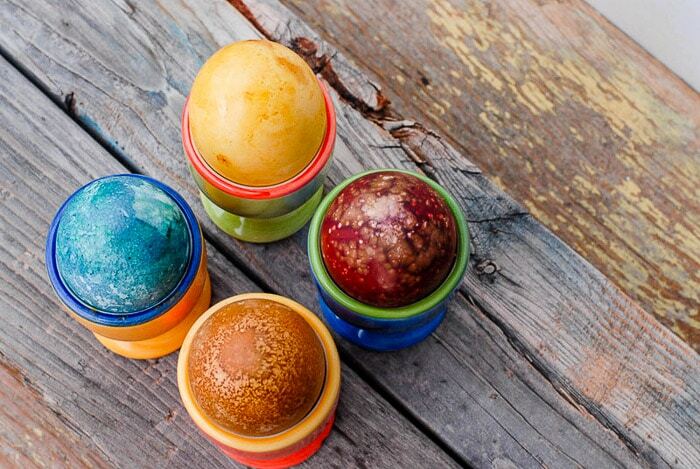 Natural egg dye is made of herbs and vegetables creating earthy colors and patterns. Being a food blogger, I had to find the food aspect to feature with relationship to this book. Eggs seemed apropos, after all the book is about the Easter BunnIES (yes according to this there are multiple bunnies and traditionally all male) and delivering eggs. I’ve always been intrigued by the notion of naturally dyed Easter eggs so felt this to be a perfect chance to experiment. It would be impossible for me to be any more excited about my natural dye endeavor; so rife with chromatic opportunity and exploration. I researched like a mad woman to find the best method of dying eggs. I put a few techniques together and had a very successful experience. 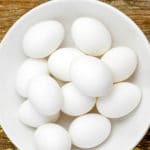 The eggs will need to be hard-boiled before dying. The following recipe is a good one to cook them well, low amount of cracking and easy peeling. 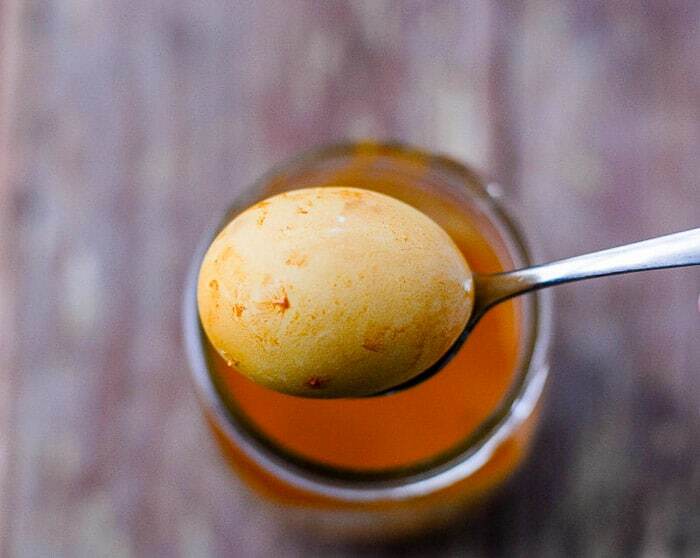 This recipe for How to Make Perfect Instant Pot Hard Boiled Eggs is a favorite too. Place eggs in a large pan and fill with cool water (if eggs have been at room temperature make the water warmer). Place on the stove top and bring to a boil. Once the water in the pan has begun to boil, turn off heat. Let sit for 15 minutes. Place pan under cool running water (don’t dump out water the eggs cooked in) over the sink allowing the water to become fully cool in the pan gradually. This will cool the eggs slowly preventing cracking, but also makes them easier to peel. You will notice all ingredients create dyed water at very different rates. Beets were very fast; maybe 10 minutes. Spinach took a very long time; a few hours. I wanted my dyes very intense so simmered them for a few hours. 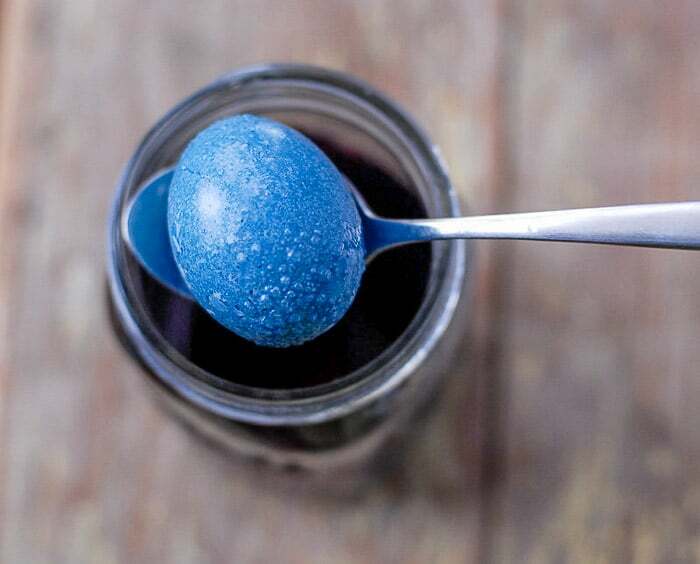 The natural egg dye from red cabbage is a purple color BUT it does make eggs a deep blue when they soak in it! This almost drove me mad so I’m going to break the code on this for you now. Red cabbage DOES make the eggs a blue color. I’ll spare you the chemistry about it (which I did research) but trust me, your egg sitting in a gorgeous purple dye WILL come out blue. This dye took longer to set in but was very blue when I took the eggs out after soaking overnight. Natural dye easter egg after sitting overnight in red cabbage dye. 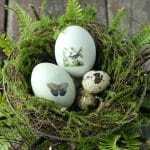 This natural egg dye does make the egg green but a very earthy, bottom-of-a-pond green. If you are looking for something that would match a leprechaun’s coat, this is not it. Natural dye Easter egg after sitting overnight in spinach dye. When mixed with water it becomes very silty. I just wiped any excess off once the egg completed dying and drying. Natural dye Easter egg after sitting overnight in turmeric dye. 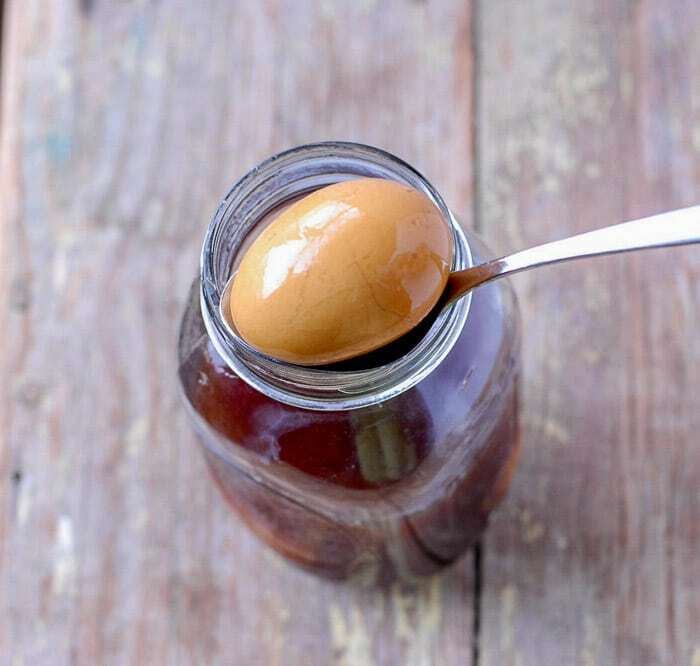 I began using bowls but quickly switched to quart volume Mason jars with wide mouths (wide mouth if possible, makes it easier to get the eggs in and out). 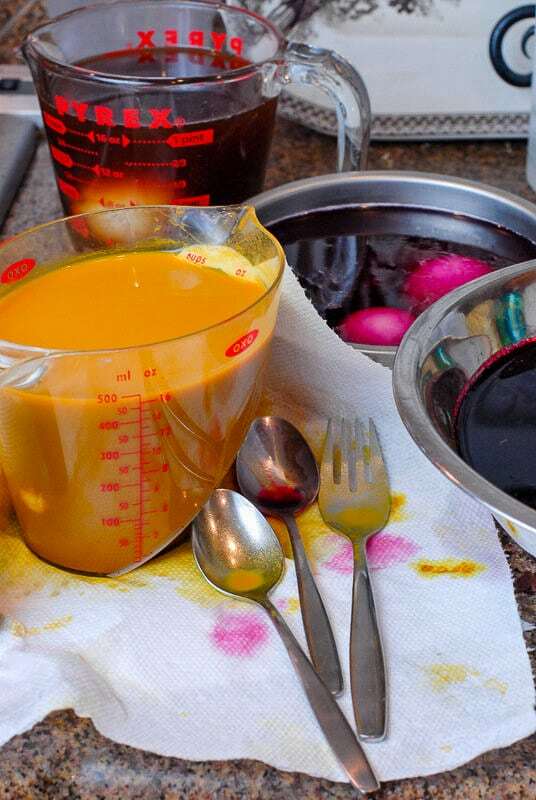 The final and recommended solution: soaking the natural dye Easter eggs. The other thing is I recommend soaking these overnight for optimum color transfer. If so, and if you plan to eat them, you’ll need to store them in the refrigerator. Having a jar with a secure lid is the way to go (no one wants to stage a scene looking like a remake of the movie Carrie happened in your fridge were the beet dye to spill). Natural dye Easter egg after sitting overnight in red beet dye. Instructions can be printed via the recipe card below. There is some personal discretion with the amount of the natural dye ingredient. Part of what you can consider is the depth of the dye color; for more dye or darker dye, use more of the item. Adjust for your needs. In a saucepan add the item which is the source of the dye (e.g. beets, spinach, etc). Add water to the pan to reach 1 inch over the top of your dye source. Bring the water to a boil then reduce to a simmer. Simmer the mixture until the water is the color you would like for your dye. NOTE: The eggs will be lighter than the dye so bear this in mind when picking how dark you want it. 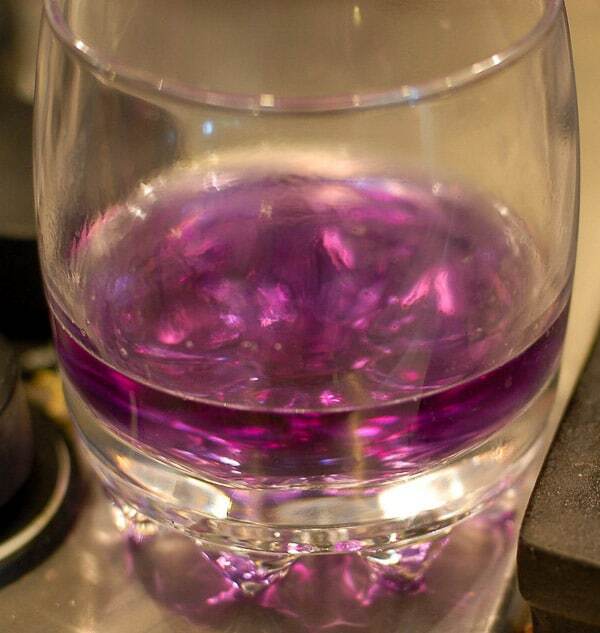 After having reached the desired color, carefully strain the dye mixture into a glass measuring cup and discard the dye source material (e.g. beets, spinach, etc). Add 1 tablespoon of white vinegar per 1 cup of liquid. Allow the mixture to cool before adding eggs to avoid cracking. 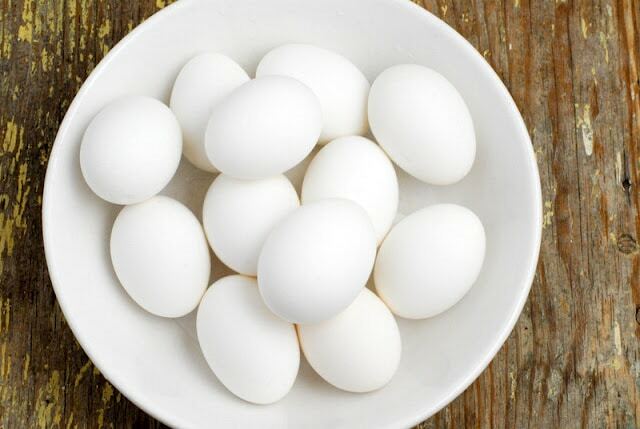 Allow eggs to soak until desired color is achieved. I immersed mine in dye in the afternoon and put them in the fridge overnight. Not only was I surprised and delighted about the colors but they also took on some interesting textures. 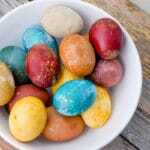 Remove eggs from the dye and put them in an egg carton to dry. The eggs appear chalky when dried so I rubbed some canola oil on them with a paper towel which worked great (it may take multiple coats and don’t rub hard or the dye will rub off). If you will eat them remember to keep them refrigerated. Natural dye Easter egg after sitting overnight in dill seed dye. 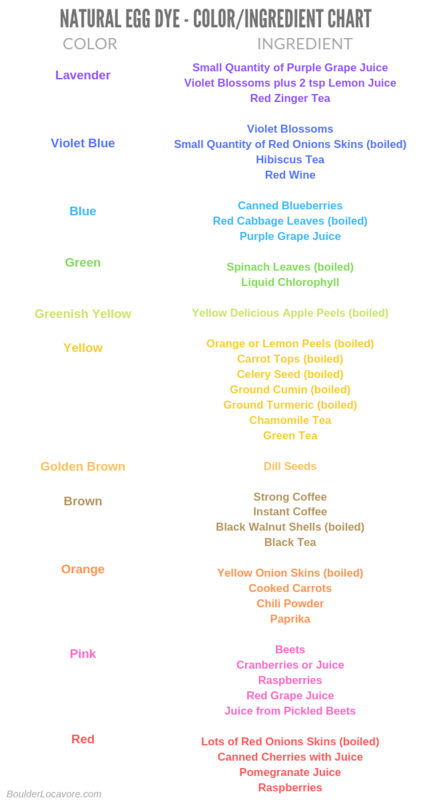 This chart offer more ingredient ideas for making natural dye Easter eggs! Print here. In a saucepan add the item which is the source of the dye (e.g. beets, spinach, etc). There is some personal discretion with the amount:for more dye or darker dye, use more of the item. Add water to the pan to reach 1 inch over the top of your dye source. Bring the water to a boil then reduce to a simmer. Simmer the mixture until the water is the color you would like for your dye. NOTE: The eggs will be lighter than the dye so bear this in mind when choosing how dark the dye is. After having reached the desired color, carefully strain the dye mixture into a glass measuring cup and discard the dye source material (e.g. beets, spinach, etc). 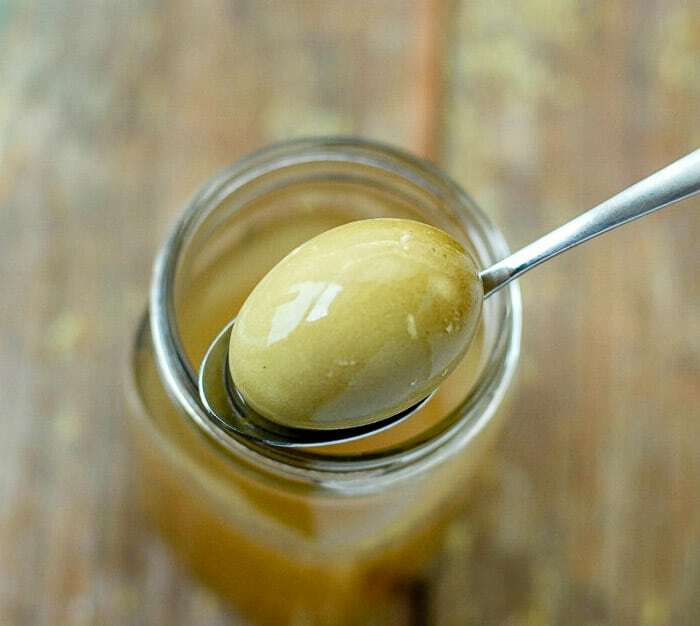 Add 1 tablespoon of white vinegar per 1 cup of liquid. Let the eggs soak until desired color is achieved. NOTE: I immersed mine in dye in the afternoon and put them in the fridge overnight. The eggs appear chalky when dried so I rubbed some canola oil on them with a paper towel which worked great (it may take multiple coats and don’t rub hard or the dye will rub off). 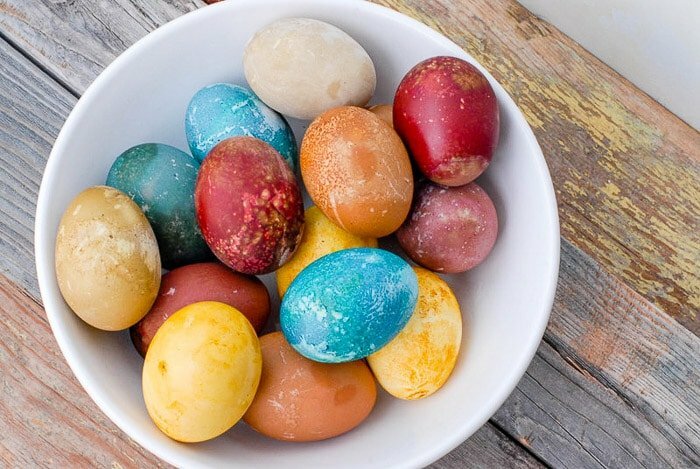 Keep dyed eggs in the refrigerator if you plan to eat them. I used about 6 small beets (chopped into four pieces each), a large bag of spinach leaves, about 1 cup of dill seeds, ½ cup of turmeric and a half of a small head of red cabbage chopped into chunks. On straining dye: It can be strained into a bowl and poured into the jar or container being used for dying. Very neat! 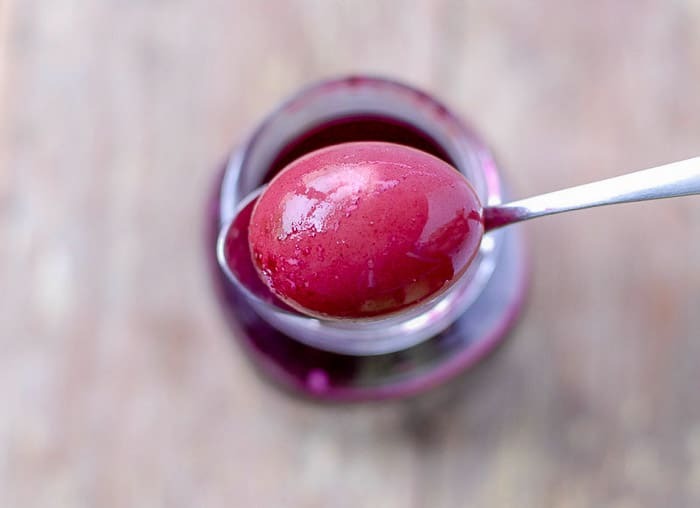 You can also use boiled peel’s from a yellow onion to get nice rich red dyed egg’s. Try onion peels!! Yes that flaky outside that you throw away? Just throw it in with your boiling water and eggs and they will come out a beautiful reddish/brown/orange!!! It’s a Polish tradition for Easter!!! I love that idea Monika, thank you! It’s so fun to take ordinary kitchen spices and vegetables and color eggs. 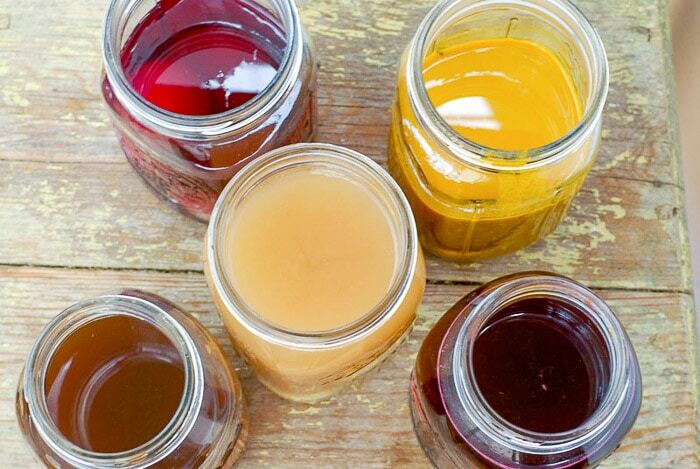 Can this natural dye work on fabrics? 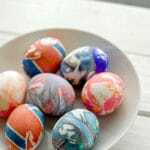 I have only dyed eggs Jill but have seen fabrics dyed with beet juice so I would imagine it would work. You might need to research how to set the dyes in the fabric (so it would not rinse out if you wash the fabric) or how long to soak the fabric. I’m sure if you Google it you’ll find information. Hi Maritta! 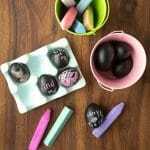 This was my first time dying eggs this way so I'm definitely not an expert but I wonder if you looked at the last photo in the blog article which shows the eggs before and after being dabbed with canola oil? I would say my beet dyed eggs were a rusty red, and more brown when dried. When I dabbed them with the oil however they stayed more red than brownish. I was surprised too to see the color difference between them coming out of the dye and when they were dried which is what gave me the idea to oil them. great informative post. thanks for sharing. it would be fun to try this!